Some Brisbane city buskers can make a healthier living on the street than in a normal job. According to 39-year-old guitarist Tim Brennan (pictured) the corner of Elizabeth and Albert Street, outside bookstore Borders, is the place to be. “I make about $700 a week there, Wednesday to Sunday from 8 ’til 4. It’s great!” he said. There are more than 100 licensed buskers performing for Brisbane residents and tourists in our busiest malls and squares. Mr Brennan said the most important part about busking for him was the opportunity to perfect his art. “I learnt how to be a musician on the streets definitely,” Mr Brennan said. Queen Street Mall, Valley Mall, Brisbane Square and King George Square buskers must audition in front of a panel of Brisbane City Council selectors to receive a free licence entitling them to three months’ busking rights. They are judged on the suitability of their act, how well they will engage with the public, their confidence, ability to perform within a congested Mall environment and the number and types of acts already operating with licences. Licensed buskers include musicians, mainly guitarists, balloon makers, circus performers, human statues, mimes, cartoonists, painters and spray-painters. Newcomer to Australia, 23-year-old Japanese student and amateur guitarist Masayuki Mori, began busking in April and has not looked back. “My friend suggested I try to make money by busking. I make $25 for two to three hours on weekends and holidays. I don’t work week days, I’m at school,” he said. Mr Mori said the meagre donations were worth being his own boss, choosing his own hours and honing his craft. Buskers are also allowed to perform outside the boundaries of the Queen Street Mall, Valley Mall, Brisbane Square, and King George Square licence-free. Auditions are held every six weeks for aspiring Queen Street Mall, Valley Mall, Brisbane Square and King George Square buskers. The next is on Wednesday 26 May from 4pm to 6pm at the performance stage in the Queen Street Mall. 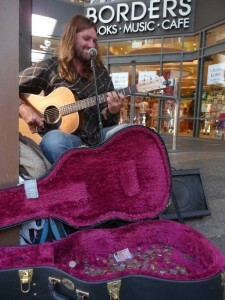 Great article, the Buskers in Brisbane are fantastic. This could be right up their alley! In light of the recent success of Australia’s Got Talent, the Irish Club (175 Elizabeth St) is giving musicians around Brisbane a chance to showcase exactly what they’ve got. We have all been astounded by the musical talent unearthed in Queensland and throughout Australia. Now it’s your moment in the spotlight! The Irish Club’s Open Mic Night will begin in early June and will run for 15 weeks while musicians will battle off to win a whopping grand prize of $1000 CASH!